Add a fun twist to your next get together or date night with these free recipe swap cards and ideas for a fun brunch with a French party theme. This post is sponsored by Pinnacle® Imported Vodka. Summer is here and one of my favorite ways to enjoy the warmer weather is by not cooking. 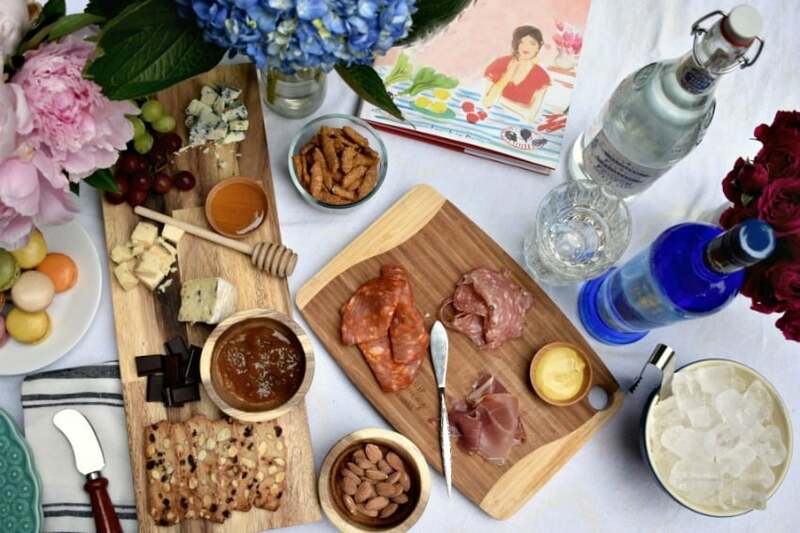 I’m a huge fan of French inspired food anyway, but it’s especially wonderful in the summer months because eating cured meats and cheese and fruit and nuts is a delicious way to stay out of the kitchen. 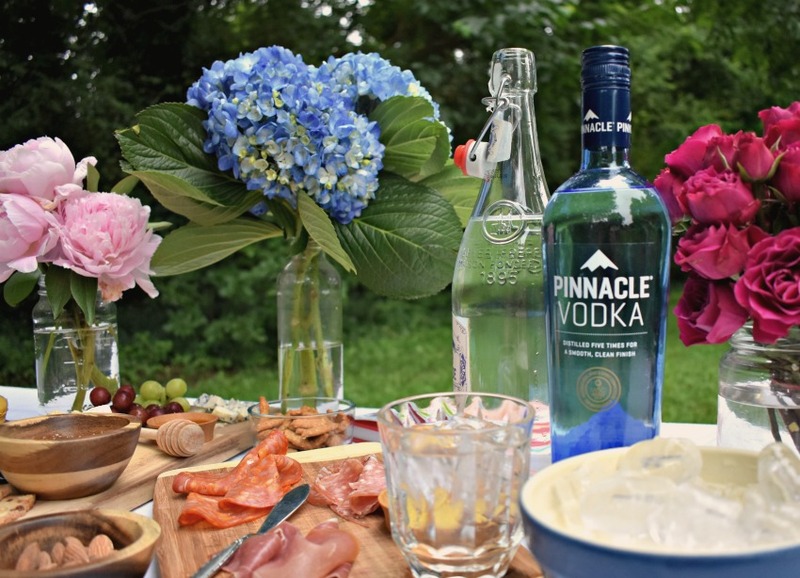 Planning a get together with a French party theme is as easy as grabbing a few groceries, some gorgeous flowers and some tasty beverages made with Pinnacle® Original Vodka, which as you may have guessed is made in France. Oui! French inspired entertaining is not only fun, but it’s really beautiful. I had as much fun picking out the authentic elements for my table as I did eating the food! I love the relaxed feel of different linens, plates and serving dishes. The pieces I was sent were perfectly complemented by my own items. I love the way a mis-matched table setting adds so many layers to the decor and it’s really simple to put together. Grab a variety of meat, cheeses, fruits, jams and nuts to serve your guests. To me, nothing is quite as pretty as a lovely charcuterie and cheese board full of delicious French ingredients. 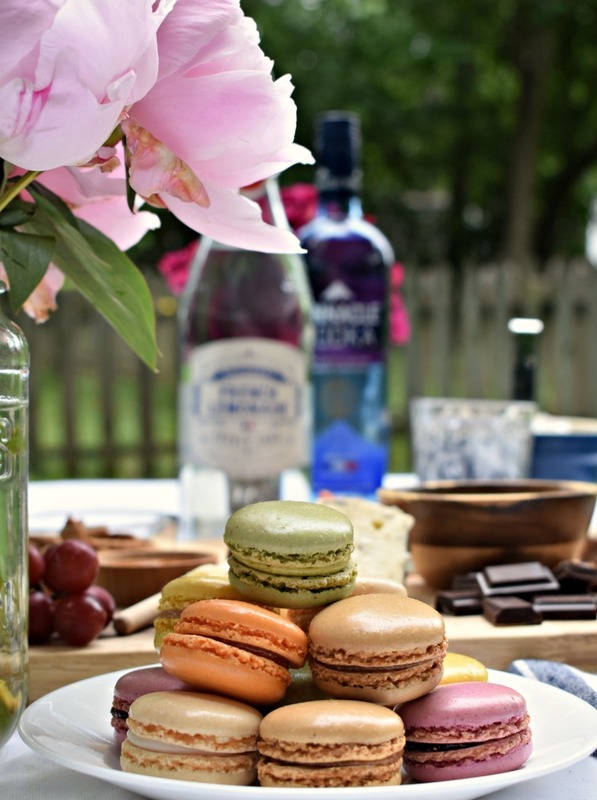 And no French party theme is complete without a lovely display of macarons. Not only are they super yummy, they’re just too adorable to skip! The great thing about French food is how pretty it all is. All you need to do is gather a tablecloth, a few cloth napkins and fill some mason jars with flowers to complete the table. I used hydrangea, peonies and spray roses for some variety. It really doesn’t take much to make an impact. Whether you’re planning a ladies’ brunch or a date night, a refreshing drink to sip on is always a treat. 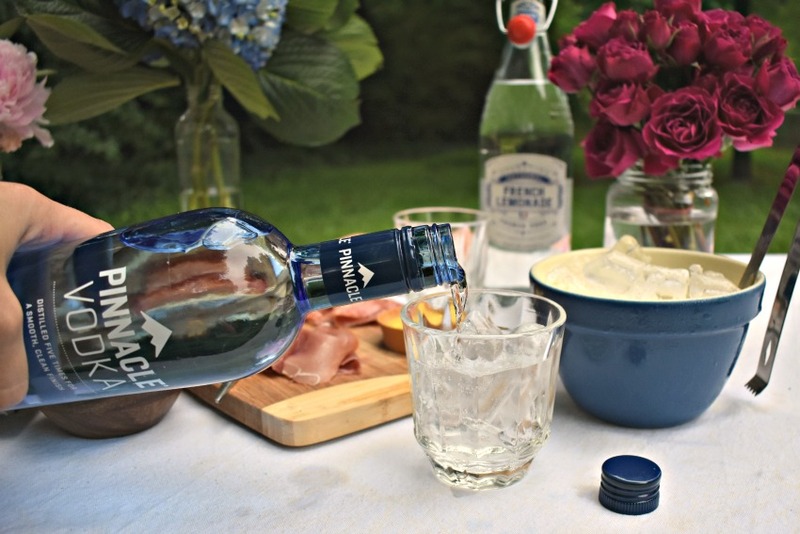 So why not keep the French inspiration going with a French Vodka? 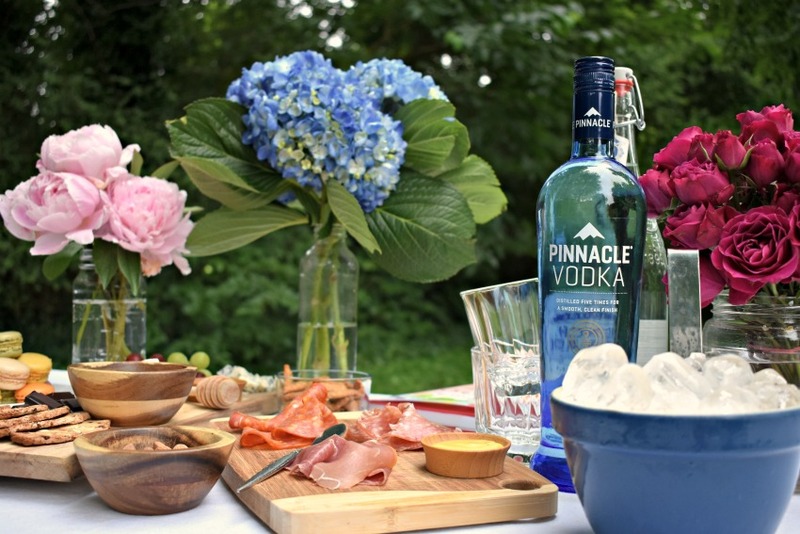 Award-winning Pinnacle® Vodka is created with French ingredients and distilled five times in France’s Cognac region. Create your own cocktails as way to enhance any party or even a low key evening at home. Stir up some delicious vodka lemonade on a warm day or spice up brunch with your favorite spicy Bloody Mary recipe (highly recommend adding bacon to that one). I’m not much for party games but I do love swapping great recipes with friends. Have you ever done a cookie swap during the holidays? Why not add a little giving to your French party theme and let everyone leave with some inspiration? Guests can bring their favorite French food or drink recipe along and trade for more tasty treats! 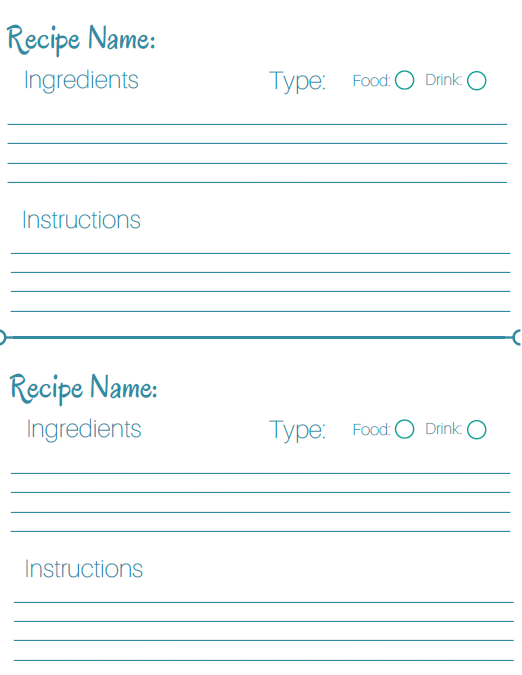 Feel free to use my free printable recipe cards to get your swap on. Just click below and print! I recommend using card stock so the recipes last longer. If your guests don’t know any French recipes, no worries! Just leave a cookbook or two out with some blank cards so everyone can pick something new to try. You’ll have everyone saying, “c’est délicieux”, in no time! Imported Vodka, 40% Alc./Vol. Distilled from Grain, ©2018 Portfield Importers, Chicago, IL, USA; All trademarks are the property of their respective owners. All I have to say is OOH LA LA! I love having a fancy appetizer kind of night. I just wish Pinnacle came in a glass bottle. It feels fancier that way! This did come in a glass bottle but maybe they have different kinds? It was so good! Yum! Coming right over. I feel like this is an excellent idea for a celebration.